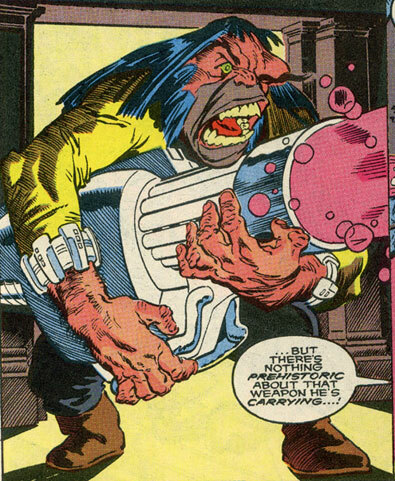 Powers/Abilities: The Troglodyte had a brutish appearance and did not appear to possess any superhuman powers (see comments). He wielded a gigantic stolen Transporter gun capable of teleporting objects or people into fictional worlds. For example, if the Transporter blasted a poster of a city, it would teleport the Troglodyte and nearby people into the city seen on the poster or, in the case of books, it would teleport Troglodyte and surrounding others into the fictional world of whatever book he blasted. History: (Adventures in Reading Starring the Amazing Spider-Man I#1 (fb) - BTS) - An illiterate, the Troglodyte stole a Transporter device from Professor Eaden in an effort to have adventure without reading and Spider-Man soon got involved, tracking the Troglodyte down. (Adventures in Reading Starring the Amazing Spider-Man I#1 (fb)) - Confronting the Troglodyte, Spider-Man swung down near Enoch Pratt Free Library and noticed a city poster. The Troglodyte fired the Transporter ray and hit Spider-Man, transporting him into the city. (Adventures in Reading Starring the Amazing Spider-Man I#1) - Spider-Man appeared in the city in front of teenagers Cara, Mike and Dwane and barely had time to warn them of the Troglodyte's threat before he showed up, blasting the Transporter at random things. Spider-Man ordered the teens to run for it while he drew the Troglodyte's fire, which hit a bookshelf. The Lost World by Arthur Conan Doyle fell from the shelf and the Troglodyte blasted the book with the Transporter, teleporting Spider-Man and the teens into The Lost World, where they were attacked by a dinosaur. After Spider-Man and the teens battled pterodactyls, they were blasted once more by the Troglodyte's Transporter, this time hitting War of the Worlds by H.G. Wells and teleporting Spider-Man and the teens into the fictional world of War of the Worlds. As Spider-Man and the teens battled the Martian Masters, the Troglodyte attempted to blast them again but Spider-Man dodged the blast. Hiding behind a tree, the Troglodyte eventually managed to hit Spider-Man again, transporting the hero and the teens into The Jungle Book, where Spider-Man spotted the Troglodyte but before he could act, the teens and he were caught up in a battle between Shere Khan and Mowgli. Zapping Spider-Man and the teens again, the Troglodyte transported them into That Was Then, This is Now by S.E. Hinton, where Spider-Man noticed the Troglodyte sneaking about a basketball court. Engaging the Troglodyte in a fight, Spider-Man caused the Transporter to activate, inadvertently teleporting them all into Ivanhoe. The shock caused the Troglodyte to drop the Transporter weapon and disappear into the crowd. Spider-Man quickly set out to find the Troglodyte, asking the teens to look for the Transporter. When Cara located it, Spider-Man waited until the Troglodyte appeared and attacked her then jumped into battle with the Troglodyte. Following a fierce fight, Spider-Man webbed up the Troglodyte and the teens used the Transporter to blast Dwane's library card, sending them all back to Enoch Pratt Free Library. The Troglodyte was taken into police custody and as he was led away, he admitted that since he couldn't read, the only way he could enjoy books was by transporting himself into the stories. Professor Eaden explained to the Troglodyte about the prison's reading program and promised she would help him learn to read. Comments: Created by Louise Simonson, Jon Bogdanove and Hilary Barta.